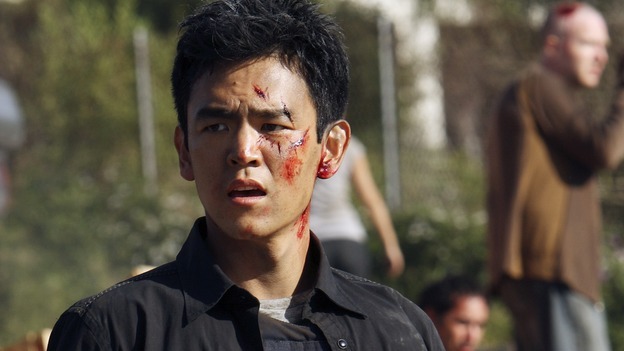 John Cho plays FBI agent Demetri Noh in "Flash Forward." ABC hasÂ Â canceled “Flash Forward,” theÂ Â sci-fi show that starred John Cho in one of the most visible televison roles for an Asian American actor in recent years. Cho played FBI agent Demetri Noh, who was part of a team that was investigating why everyone on the planet blacked out and saw visions of the future. The high-concept show started with a bang and seemed to have promise. After a few bad episodes, I thought the show was starting to pick up. But it never caught on with many viewers, and aÂ Â three-month hiatus didn’t help, so ABC canceled it. The show was also notable for having Noh in anÂ Â Asian-black interracial relationship with a character portrayed by Gabrielle Union. At leastÂ Â we’ll see Cho in sequels to “Harold and Kumar” and Â “Star Trek,” but I’m disappointed ABC didn’t give “Flash Forward” a chance. Anybody else wish it was renewed?